In Music We Trust - INTERVIEW: Nada Surf: They're Back and They're On Their Way To Being Popular - Again! They're Back and They're On Their Way To Being Popular - Again! You probably know of Nada Surf. Their song, "Popular", off of their debut, High/Low (Elektra Records), was the runaway summer hit of 1996. Everyone was singing it that summer. But, success is fleeting, and when the band's second single failed to grab the attention of radio listeners, the band's label, Elektra Records, sent the band back into the studio to record the follow-up. 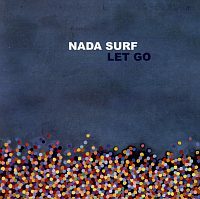 The result was a beautiful, lyrically deep post-punk/pop gem that found Nada Surf coming into their own. However, Elektra Records didn't hear a single, and the band soon found themselves without a label, or an album to follow-up High/Low. The label decided to release the record, The Proximity Effect, in Europe in 1998, but refused to in the states, leaving Nada Surf in limbo as far as U.S. audiences were concerned. After going back and forth with Elektra over a three year period, the label finally gave the band the record, so front man Matthew Caws decided to start his own label, Mardev, and release it himself. "I've always romanticized about having a little label but I never really meant to release our own records," Caws tells me. "I didn't want to sell our own cupcakes. Plus, it took too much time and took time away from the band. I would have to do all this label stuff when I could have been working on writing songs and working with the band. And after everything we went through with our career to get The Proximity Effect out, I really didn't want to deal with all the business stuff that goes with running your own label. I would love to have to never think of those things again." If being dropped and having to fight three years for your record back wasn't enough bad luck for Nada Surf, then came more. After landing on their feet again and releasing The Proximity Effect, right before the record was looking to be solvent, the label's distributor Flydaddy went under, as did Valley Media, which owned Distribution North America. That settled it for the band, they were not going to self-release their next record, nor were they going to put it out on a major if one came knocking. They were going to look for a good-sized indie to release it on. They then went into the studio to record their third full-length, the aptly titled Let Go, an album that represents a clean start and redemption for the band. "The title comes from a line in "Blizzard of 77", the album's opening track," says Caws excitedly. "The song deals with thinking about how you hold on to certain insecurities of what you are and aren't. How you get trapped by your own inner press and how it can trap you and hold you down. Not press as in reviews, but press as in the ideas that form inside you. I like the idea of redemption and starting clean, starting from scratch and owning up to your mistakes." The band happens to share titles teen superstar Avril Lavinge, who's debut full-length is also entitled Let Go. "I did fear using the title Let Go," laughs Caws. "We were sending the record to be manufactured during her astronomical rise to fame. But we decided to stick with it. Its not like the album is called Jagged Little Pill or something. Let Go is generic enough that it shouldn't bring any conflict." With a finished album in hand, the band began looking for a label for the U.S. Releasing the record in Europe on EMI in September, the band continued to talk with U.S. labels before calling Barsuk home. "We were talking to Astrelwerks for a long time about releasing the record," Caws informs me. "They are nice people and we really like them a lot. But, without being too hung-up, we have a bit of a hesitation to corporate America. Not that we're completely opposed to corporations, as our European label is EMI, but Astrelwerks was going to own the record and the next few records. We didn't want that. "We had been talking to Barsuk for a long, long time. And so we decided to go with them and September didn't work for them for a release date so it is coming out in February." "Where we're at now is where we wanted to be when we got signed to Elektra," confesses Caws. "It's the first time it feels right. The major label thing was kind of a conceptual thing because it's all we could get. We recorded the record twice because we changed drummers. We originally recorded it for a Spanish label based on the single they had heard. Then we sent the completed record to them and they got all weird on us and wanted it for the world. So of course we had to say no because they had no U.S. distribution. Then I sent it to Merge, Touch and Go, and Matador, and they had no reason to open the package. Then Elektra just happened. We played a show and someone came out to see us. Two days later they offered us a deal and we were on Elektra. "We were hesitant because we knew they just wanted to sign a single and not a band. And, of course, our worse fears were confirmed. Then we self-released and now we're on the kind of label we wanted to be on originally." Happy with where they are label wise, the band is also equally happy with where they are musically. 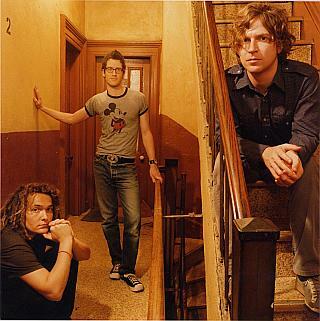 Moving beyond the post-punk/power-pop of the previous albums and delving into some quieter songs, Nada Surf was able to stretch their wings and really write for themselves, for the first time. "We're very happy about how the record came out, the loud songs mixed in with the quiet ones. We have always wanted to do it but we were scared of trying," admits Caws. "For us it was a big deal to play quietly, even though it's not quiet like Low or Ida. Still, it felt weird to break away from the garage-y power-pop type stuff." "What is so great about Let Go is that it was made in a vacuum," he says, proud of the fact that they disappeared for awhile. "We only played demos for a few people. It was like making your first record. Nobody was expecting it. So we could be more experimental. Some songs we finished writing right before we recorded them. The engineer would be scheduled to come in at noon and we'd tell him to come in around 2-3 because we weren't ready for him yet." The record was self-produced by the band, due to the fact a friend, who was originally scheduled to produce the record, was called off on a six-month job to handle Pro Tools tuning for Korn's bass. "I'm 100% happy with the record. Let Go seems to have space whereas The Proximity Effect was the speakers pushing you. Here the speakers are inviting you. I like the space." Proud and ready to tour, the band is setting out for a U.S. tour that will keep them busy until June. Look for them in your town soon.